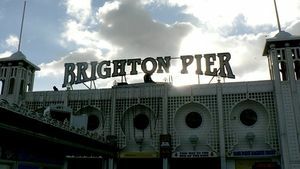 Seaside entertainer Tony Lidington takes a trip to Brighton for Radio 4 Extra and reflects how this city has inspired a wealth of seaside memories captured in the BBC Sound Archive. Tony came to Brighton in the eighties as a student and set up his own Pierrot Troupe, The Pierroters, named after the rotting West Pier. There are first hand memories of what it was like to go on a seaside holiday between the wars in the 1984 programme called ‘Sand Between the Toes’. Tony meets Max Tyler an expert on the Fol De Rols. He and Tony hear them perform in an extraordinary piece of archive from 1937 when four of the shows, hundreds of miles apart, were brought together live by the magic of wireless. There are also insights into Brighton’s very own Cheeky Chappie, as Tony visits a Fish and Chip Shop in Brighton where the Max Miller Society has set up a museum. ‘Casting Shadows’ a wonderfully evocative play by Mark Burgess conjures up an imaginary meeting between the actor Laurence Oliver, playwright Terence Rattigan and Brighton’s famous seaside entertainer, Max Miller. Roy Hudd headlines as Miller. Gavin Henderson president of the National Piers Society reveals that seaside Piers were initially places of sophistication, almost the arts centres of their day, and Rachel Clark of the West Pier Trust looks to the future and the plans to create a new vertical Pier on Brighton seafront. Tony celebrates the Great Days of the West Pier in his 1995 Archive Hour ‘Oh What a Lovely Pier!’ with contributions from among others the late Corin Redgrave. Broadcast on BBC Radio 4 Extra at 9am & 7pm on 24th August, 2013. 3 hours. 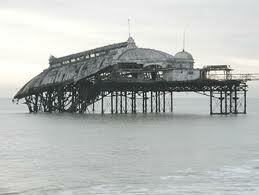 In 1983, I formed a pierrot troupe – ‘The Pierrotters’, named after the rotting West Pier in Brighton. 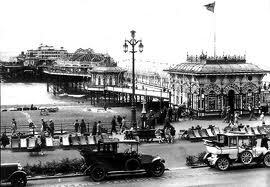 At that time in my life the pier stood as my inspiration and muse on the seafront just outside my flat in Regency Square. I bought an old, second-hand banjo with my 21st birthday money; spent nights sewing-up yards of white bridal satin and black lycra; learned 6 songs with my friends from Sussex University and went busking on the beaches and promenades. 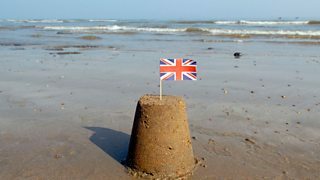 Radio 4 Extra at the British Seaside delves into the BBC Radio archive to admire and understand the way in which the seaside has contributed to British popular culture today. The seaside is a quintessential part of being British – the coastline defines our national borders and it is to this geographically liminal space (where sea and land meet), that the British character is most apparent: the British sense of fun and mischief has always been a part of the seasides since they became the destination for mass holiday-making in the mid-Nineteenth Century. Yet even before this, from the Regency Age of King George IV’s outrageous self-indulgence in Brighton, the seaside has been home to the exotic, the saucy and the experimental in all its cultural forms – architecture, engineering & technology and behaviour…and it still is!